Yes, I know that there are conflicting dates on the internet for this scarf. I got the dates directly from Hermes. Notes: features the famous military riding school at Saumur in western France. It demonstrates in 13 images that a horse can understand and do anything, as long as one knows how to ask it of him. 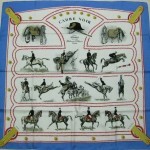 A pirouette at a gallop, the “croupade”, courbette, and “passage” are a few of the figures shown on the carre. 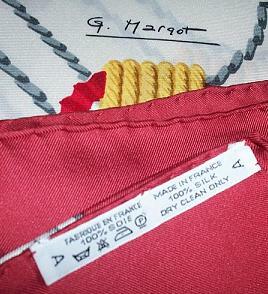 Check out Ecole Française d’Equitation for another carre that Margot designed about Saumur. Margot was its écuyer en chef and the author/illustrator of several books on riding. Original issue will have white contrasting roule and no copyright. Posted on Wednesday, January 2nd, 2008 at 8:24 pm	under Carres - 1950s	.